It wasn’t that long ago when baseball and steroids were as common as peanut butter and jelly. However, in an era where baseball is desperatly trying to clean up its “juiced” image, the Biogenesis case has certainly been a black eye. In a game that once encouraged players to get as big and strong as possible in order to hit tape measure home runs, it just seems that every time baseball is just about to even playing field, we come to find out that yet another superstar took steroids. This isn’t the first time Ryan Braun and steroids have been linked together. Just a few years ago the Brewers slugger was found guilty of using performance enhancing drugs. While the original suspension was appealed and later reduced, the fact that baseball was now implementing the 50 game suspension. Now Major League Baseball has found out that once again Mr. Braun has been getting a little too brawny. For his second strike, Major League Baseball gave Braun a 65 game suspension, and there are rumors that A-Rod could be next. Braun has become the villain of baseball, and MLB might be happy about that. They need to create a poster child for what happens when you cheat and cheat again. For College Football it was SMU, for the NFL it was Pacman Jones, and the NHL Billy Couto. MLB wants to prove that no superstar is too big, and that it will no longer tolerate the substance abuse that has plagued the game for decades. This will also lead to the question, what happens if he is caught for a third time? Will it be the classic baseball saying that “three strikes and you’re out”? Will MLB now consider a life ban from the game? Either way Braun has let down his team, and his other players. Will the problem of performance enhancement drugs ever go away? In my opinion it will never go away. As long as there are millions of dollars at stake players will take the gamble. Seriously if the risk was sit fifty games but make fifty million if you took performance enhancers you’re telling me that most if not all people would take that risk? Here’s what I think. Will a lifetime ban be effective, not really because you already have two chances to clean up your act before the final strike. You really want to stop these players? Hit them where it hurts, the wallet. Have a new rule in their contracts where if they are caught taking performance enhancing drugs that they can be terminated immediately and t will lose any money remaining on their contract. 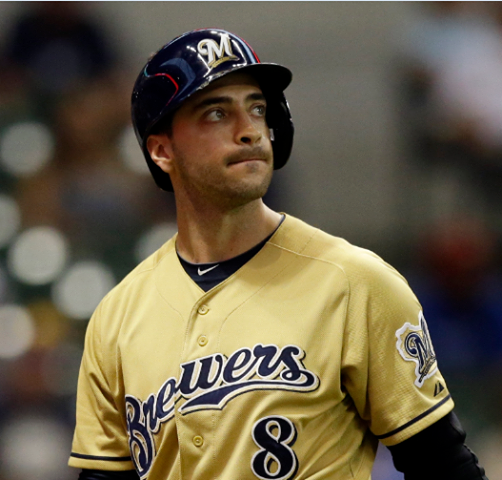 With Ryan Braun’s suspension, baseball is taking a step in the right direction, but they need to do more. Whether it is right or wrong baseball is going to make this guy a villain. Baseball needs a person who will now not only pay the consequences on the field, but socially and in the media. The media is going to rip Braun apart for cheating, while the majority of baseball fans will look upon him with disgust. It’s truly sad to see some one cheat their way to the top. Being a former player and not cheating my entire life it angers me when I see other players getting ahead by taking short cuts. Despite how he has tainted baseball, Braun may be a great thing for the game. Because he is the villain and now has been dragged through the ringer, maybe the rest of the pros will finally wake up and stop juicing.